Blow drying, curling, straightening and coloring hair are all things many women do to make their hair look more beautiful. Unfortunately, these activities can all damage the hair and over time, they can strip the shine from hair leaving it dull and even frizzy. Many salons offer a gloss treatment for the hair, which add the shine back and can even strengthen the hair cuticle. Though the cost varies depending on location, women all throughout the United States have been getting gloss treatments at salons to make their hair look shinier and more full of life. According to "O," the Oprah magazine, prime candidates for a hair gloss treatment are anyone who has treated hair, especially chemically straightened hair or hair that is dyed. The magazine states that a gloss treatment works best on people whose hair highlights are either too bright or too brassy, as it will subdue the highlights. Anyone who feels that their hair looks dull and wants more shine added would be a prime candidate for a gloss treatment. A salon gloss treatment works by coating and penetrating the cuticle of the hair with extra vitamins and shine-boosting ingredients, as explained in "Marie Claire" magazine. Some formulas used in salon treatments have natural oils, which coat your hair so that the color lasts longer. Every time you wash your hair, the gloss barrier gradually fades and looses strength and in a few weeks the gloss treatment needs to be redone. There is not one standard formula that all salons use for their hair gloss treatment. 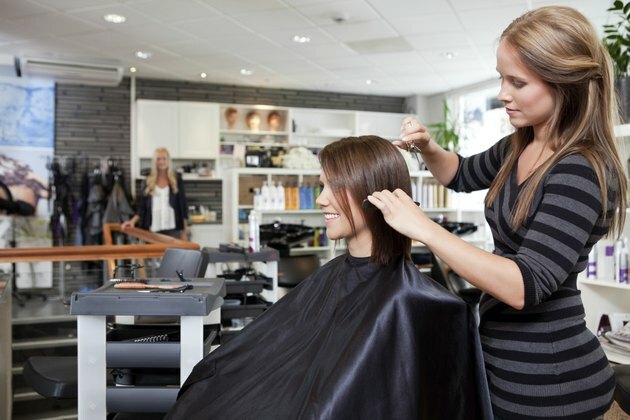 While many salons use similar ingredients, they often vary depending on the salon. In fact, most hair gloss treatments are ammonia-free. Some, though not all, salon gloss treatments contain peroxide. Though many contain natural botanical oils, some like the Sebastian brand of gloss treatments, contain cellophanes, a material derived from trees. The salon gloss treatment varies in length depending on where it is done and what ingredients are used. Most gloss treatments last about two to four weeks, though high-end gloss treatments which are usually more expensive, can last up to six weeks, according to "Marie Claire" magazine. You do not always have to continue getting gloss treatments at a certain time interval. You can simply get them every few months or as often as you like. The price of a hair gloss treatment varies based on the salon in which it is performed and the city as well. According to "Marie Claire," a gloss treatment usually costs up to $75, though it is sometimes done for free when you get your hair colored. One popular brand of gloss treatment, the Sebastian Cellophane color gloss treatment ranges from $20 to $50 per treatment, according to Fashion Wire Daily. What Are the Benefits of Hot Oil Treatments?